Eric Taylor from Fishers is LD Products Gold Line Challenge Week 2 Winner! | Industry Analysts, Inc.
Eric Taylor from Fishers is LD Products Gold Line Challenge Week 2 Winner! Have you played the new LD Gold Line Challenge? 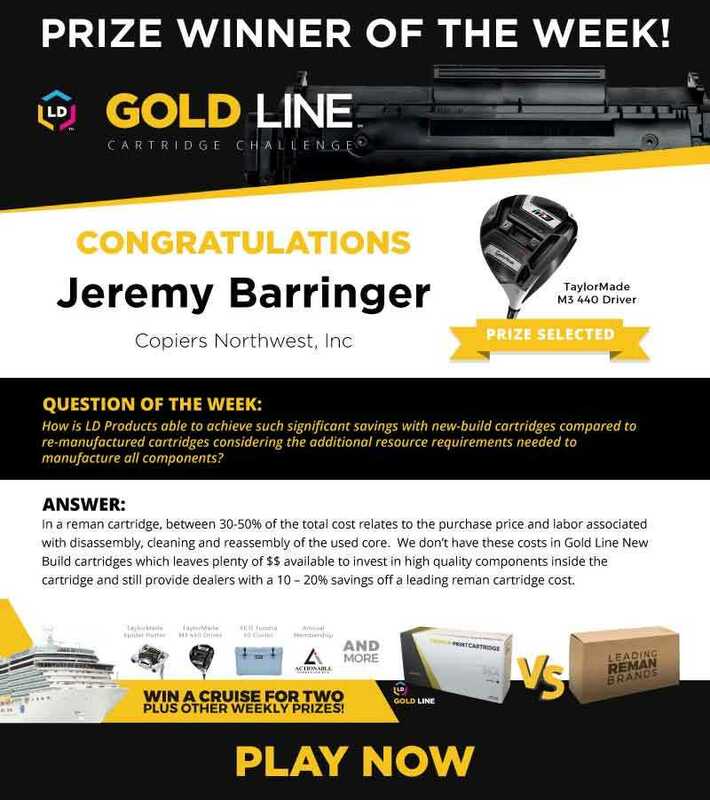 Take the challenge and you might win a prize, just like week one’s winner, Jeremy Barringer of Copiers Northwest! In less than 2 minutes, we’ll test your understanding of how two popular OEM alternatives compare on print quality, performance and profitability. Just for playing, you’ll be entered in our grand prize drawing to win a cruise for two and if you ask us a question about our Gold Line Cartridges, you’ll automatically be entered in our weekly prize drawings as well! View More Participant Questions: Click Here! Grand prize cruise winner to be announced on December 7th, 2018 at the BTA Event in Las Vegas. 2018 opened an exciting door for LD Products opportunities and business partnerships! This entry was posted in LD Products and tagged cartridges, LD Products by andyslawetsky. Bookmark the permalink.